It is like having your own CFA analyzing shares. Except that it happens every day. For every share on the JSE. Much better than the quarterly research updates you are used to. The VectorVest system looks at both technical and fundamental analysis, and combines them to give you an above average hit rate. With VectorVest, you will definitely be right more times out of ten than now. VST: VectorVest is the only service that analyses, sorts, ranks and graphs over 340 JSE shares daily for Value, Safety and Timing and gives a Buy, Sell or Hold recommendation on every stock, every day. The extraordinarily accurate VectorVest market timing system helps you buy low and sell high for consistent profits. VectorVest is the only service that combines a stock analysis system with Market Timing to tell you when to buy, what to buy and when to sell for more profitable investment decisions. The JSE Top 40 has had a wonderful year, but not as wonderful as VectorVest’s High VST Newcomers. 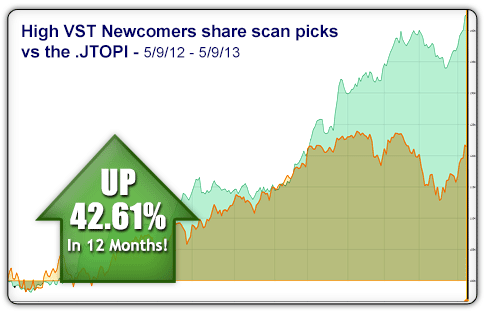 In just one year, this scan helped subscribers outperform the JSE’s top stocks by more than double! This is the one-year result of a portfolio managed with VectorVest’s Confirmed Call Timing System and the top-ranked share selections from the High VST Newcomers scan. VectorVest is a decision making platform. So it tells you what to buy, and when to buy — but you cannot execute your trades on VectorVest. You need to approach a broker. Which is where Courtney Capital steps in. You can open a trading account through us, and trade any share listed on VectorVest — both local and international. We are also very fortunate to have Vusi Michael Phiri, from VectorVest South Africa, sit on the dealing desk at our Sandton office. Vusi knows VectorVest inside out, and will be able to answer all your questions. And it is also an absolute pleasure and priviledge, to host some of the VectorVest related presentations, by Dr David Paul, at the auditorium in our Sandton office. You are more than welcome to speak to us about VectorVest. We know and use the product ourselves, and we are very pleased with the results. Ranks all the stocks according to their Relative Value, Safety and Timing. Measures the trend and the strength of the trend for the entire market. Generates clear BUY and SELL signals for every stock, every day. Integrates technicals & fundamentals into a single master indicator. You will find winners with the click of a mouse. Request a FREE copy of Stocks, Strategies & Common Sense, by Bart Diliddo, PhD, plus the VectorVest introductory and dvd.